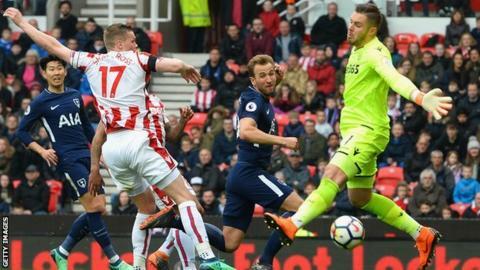 Kane was starting his first game since 11 March against Stoke after a damaged ankleTottenham's Harry Kane has been awarded Spurs' second goal in Saturday's 2-1 win at Stoke after a successful appeal. The Premier League goals accreditation panel had initially given it to Spurs midfielder Christian Eriksen.It said the decision had been reversed "after taking the player's testimony into account and reviewing the match footage". It means England striker Kane's tally for the season is now 25 - four behind Liverpool's Mohamed Salah.The Premier League said a three-person panel agreed that "the final touch on the ball belonged to Kane". Salah posted this message on Wednesday eveningThe 24-year-old said after the game that Eriksen's free-kick grazed his shoulder before crossing the line. "I swear on my daughter's life that I touched the ball, but there's nothing I can do," he added. "If they turn it around, they turn it around. If they take my word, they take my word. "It is what it is - the most important thing is that we won the game."